Last month, I spent a few days in London and happened to catch the exhibition Design/Play/Disrupt at the Victoria and Albert Museum. It’s an exhibition centered around videos games – ranging from small indie productions to huge blockbusters. One of my personal favorites was a thing called Line Wobbler made by the talented Robin Baumgarten. It’s basically a long LED strip that you can control with one of these bouncy door-stopper springs. Such a simple idea yet so addictive. If anybody knows where I can get one of those things, let me know! Last Sunday, I visited two exhibitions that presented works of Swiss artists. The first stop was GrafikSCHWEIZ18 with its focus on graphic works. Later, I enjoyed the wide variety of works presented at Jungkunst in Winterthur - from illustrations to sculptures. And the location was quite impressive. A real motivation for me to get creative. GSFA (Groupement Suisse du Film d'Animation) is celebrating its 50th anniversary this year. In order to celebrate this special occasion, there is a touring exhibition with works by various Swiss animation filmmakers. I visited the exhibition in Baden where some interesting items from Swiss animation films were on display – such as Ahmed, the doll from the stop motion film "Ma vie de Courgette". 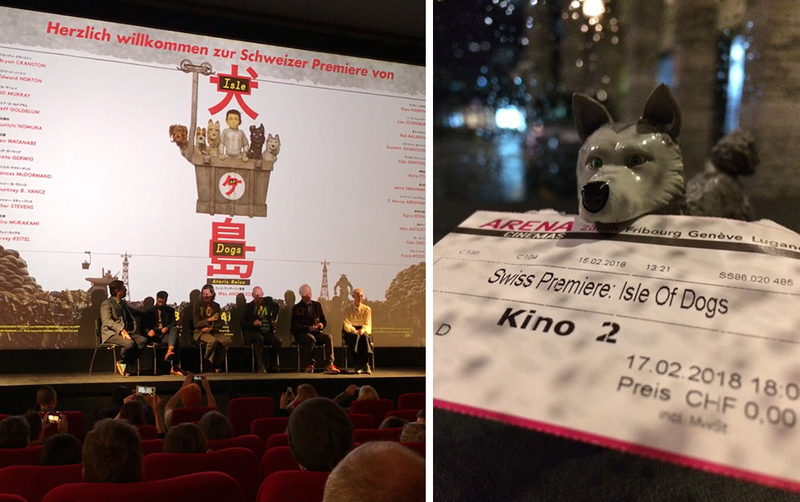 Two weeks ago, I attended the premiere of "Isle of Dogs" in Zurich. Iconic director Wes Anderson was present at the screening, and so were his collaborators Jason Schwartzman, Roman Coppola and Tilda Swinton. And to everyone's surprise, even the legend that is Bill (F*cking) Murry showed up! (Before the event, we were joking about the possibilites of Bill showing up. But imagine our surprise, when he actually did.) They did a quick Q+A before they dissappeard into the night and left us to enjoy the movie. Let me tell you: "Isle of Dogs" is fantastic! An exciting story, wonderful characters and loving attention to detail make this movie truly special. Just a shame that we have to wait until May until the movie will officially hit the big screen in Switzerland. If you get a chance to watch it, don't miss it. It's absolutely worth it! Once again, I put my "Edding Kreidemarker" to use. Inspired by the recent snow fall here in Switzerland, I came up with this winter scenery including lots of stars, pine twigs and wood branches.